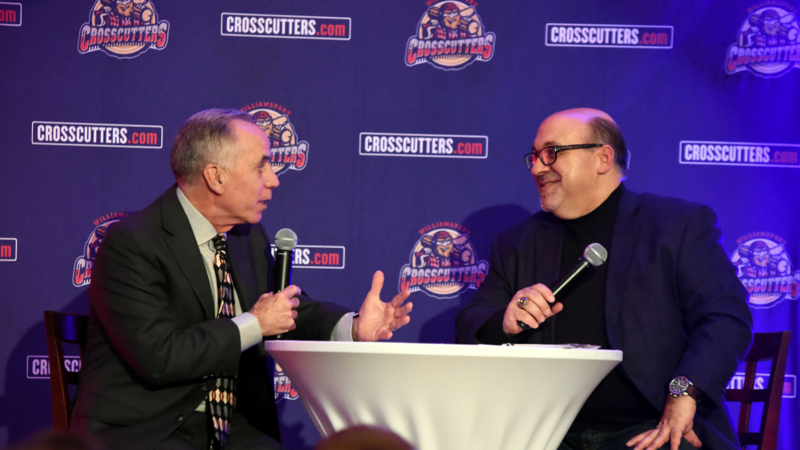 The Williamsport Crosscutters 13th Annual Hot Stove Banquet was held January 16 at the Genetti Hotel in downtown Williamsport. The event featured Phillies legendary outfielder Gary "Sarge" Matthews, ESPN Baseball Insider Tim Kurkjian and actor Dwier Brown, who portrayed Kevin Coster's father in the movie Field of Dreams. The night, presented in part by Panda Patriot Power, River Valley Transit, WRAK Radio and the Williamsport Sun-Gazette, was also highlighted by auctions that featured a wealth of sports memorabilia. Additional highlights included the induction of John Markley into the Bowman Field Hall of Fame and the late Ray Keyes in the Williamsport Sports Walk. Markley, an employee of the City of Williamsport's Streets and Parks Department for 45 years, was a great caretaker of Bowman Field and spearheaded many construction projects including new offices in the 70's, a new press box and concession stand in the 80's and press box additions in the 90's as well as a host of other projects over 4 decades of service. Keyes was a longtime sports editor at the Williamsport Sun-Gazette covering Little League Baseball from its inception in 1939 and the Little League World Series from 1947 until his passing in 1988. He was a major force in assisting in the acquisition of minor league baseball franchises for Williamsport and was the first winner of Little League's Howard Hartman Friendship Award. A portion of the proceeds from the evening were donated to the National Alliance on Mental Illness of North Central PA. At the conclusion of the festivities, they were presented with a check for $6,525. The Crosscutters 2019 home opener is scheduled for Friday, June 14 against the State College Spikes. Season tickets, bonus books and mini-plans are now available by phone, online or in-person at BB&T Ballpark.